After a long winter of inconsistent weather, the last two weeks of summer delivered a highly concentrated dose of cross country flying to many Hawaii pilots. For my part, I just flew thirteen consecutive cross country days! After racing over a 100 miles for four straight days in Oregon a couple weeks ago, I hopped on a plane to cover 2,700 miles in one long day of transpacific flying (cheating, I know), and then covered another 100 miles flying on Oahu for another eight straight days. Now that's the start of an incredible cross country summer! But I can't take the credit for any of those miles - on my own, I wouldn't have flown even half as far. I adore flying cross country, but I'm a big chicken, so I rely on the encouragement (i.e., jeering and taunting) of my flying buddies to spur me on. I look forward to flying many more hundreds of miles with all of you before this summer is over! Thanks to Thom for encouraging me to step up to the Race this year. (You know, jeering and taunting.) After years of trying, I finally had such a great result in last year's Sprint event (on Joey's awesome wing!) that it really did make sense for me to graduate to the Race event. Plus, I really wanted to fly my own sweet wing. But I had no idea how truly different and challenging it would be. They really are two different classes of event: a 100 meter dash vs. a marathon. It took Dave and Igor over 4 hours each to make goal on the last day! Those guys are my heroes. I was barely able to stay in the air longer than a couple of hours on any of the five days we flew. I covered 100 miles just struggling to make even one or two turnpoints each day. I never even got halfway around the course! I bet those who made goal every day flew well over 200 miles. Imagine if we'd had no rain days - it could have been a 400 mile week! I definitely need to practice flying longer thermal flights and maintaining my focus. And I need to work on staying high and patiently finding the high lines. Plenty to work on for next year! Also, I need to try and stick with other people more consistently. I never sank out when I was with other people - that always happened after I was alone. Well, except for the first task day where we all sank out together near the third turnpoint, after launching late under low clouds, and I was miraculously scored in a three way tie for fifth place with Josh and Rob! I know, I said three way. In my wildest fantasies I never imagined being that close to those guys! Back on Oahu, the first three days brought us relaxing cross country conditions at Kahana, and I recharged my batteries while traversing familiar lines of ridge lift around the cloud soaked foothills of my little corner of the Koolaus. I already wrote a couple of stories about those days, and teased the Makapuu crew about how we fly cross country more often than they do. Then, as a low pressure system began to degrade the trade winds, we enjoyed a thermic day at Kahana that rivaled a typical rodeo day on the west side. 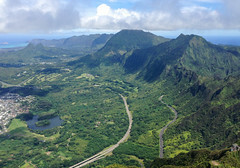 We scratched our way up and then lassoed spirited beasts between Kualoa and Laie in a windward version of the Nanakuli Valley Tour. On my early bay crossing attempt, I sank out to Kaaawa, and then got a ride back to relaunch and head the other way with Duck. Later on, Thom made great use of his recently honed racing skills, and scratched his way to Kualoa and back like a cross country champion! Once the trade winds had been squelched down to sea breeze levels, Makapuu demanded our presence. (In other words, Kahana was completely dead all day.) The clouds were a lot higher on this first day, and a downrange jaunt from Makapuu looked quite possible. I picked up Woody and we carpooled out there with visions of record breaking flights in our heads. 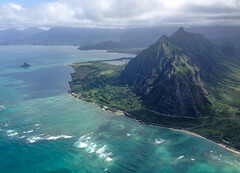 But when we got into the air we were immediately disappointed to feel strong northerly flow all along the Makapuu ridge, boosting us up above two grand without even making turns. It was clearly too north and too strong to go anywhere. Plus the clouds were occasionally brushing the Pali. Jim, Frank and Five-0 were first to venture to Puu O Kona, and I followed, but none of us were feeling the love. Then the Three Musketeers showed up: Ike, Jayson and Thom. They wasted no time in leaving Makapuu and blazing downrange. Again I followed, but as they flew down Green Walls I headed out to Olomana, based on Jorge's advice for such a north day. Thom apparently had the same idea, but wasn't able to get up there and landed with the cows at the Boys Home. I came in at ridge height and buzzed around until I got something worth turning in. 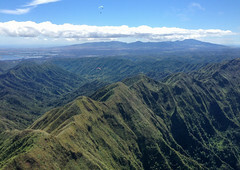 It was cool to start turning circles right above all the hikers on Olomana. I circled back to cloud base and figured I'd head back to Makapuu, but then I could see Ike and Jayson squeaking around the north flow at the Pali and getting up. Oh man, are we really doing this? I finally admitted that it wasn't too north or too strong, nor were the clouds too low, and I dashed over to the Pali to follow those guys. I struggled at Stairway to Heaven, where Gaza and Bonnie had been that morning, but I finally got high enough to cross Haiku Valley. And that's when I caught up with the two remaining Musketeers, behind Temple Valley, and we thermalled the ridges behind Kahaluu together. I got high on the ridge behind Waiahole, but those guys were talking about landing at the beach park there. I managed to squeak around the foot of the Pyramid and benched up to try a run through Kaaawa Valley. But something was different from past runs I've made through there - I found nothing but sink. I barely made it to the front of the Kaaawa ridge, lower than I've ever been there, and I tried to scratch my way up, but in vain. There was no wind at all. I blazed low over the trees for Swanzys, just barely making it there and landing in absolutely dead conditions. Of course I wish I had made it a bit farther. I've been as far as Hukilau and BYU on previous flights. But here's the best part of this flight: as I was drinking a beer and eating fries at Bobo's, Woody drove my car back from Makapuu and picked me up for the 10 minute ride home. You just can't beat that kind of logistical genius. 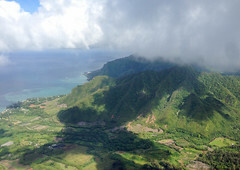 The next day was another light sea breeze day but the clouds were distinctly lower along the Koolaus. It was clear there would be no Makapuu downrange mission on this day. So I took Woody to Dillingham for some north shore thermal goodness. Thermals were strong and fat but so was the development growing out from the center of the island. I had just enough time to thermal out to the Meadows launch and back before landing. Brian said the clouds cleared right after we left and he soared there the rest of the afternoon! But we had to leave to meet Dorothy for dinner anyway. The next day was Laurel and Gaza's wedding. Gaza had suggested we try to land there, but the clouds seemed low. I ventured back a couple times but it seemed too cloudy. Then Frank noticed a big blue hole. And an orange blur shot around Ironwoods way below me. JK! I guess we were going to try this after all. Thom and I chased JK around Puu O Kona and Greenwalls, and I headed out to Olomana again. JK headed out there too, but he came in super low in the lee, and scored the craziest low save I've ever seen. I think that's JK's mantra: how low can you go! So the three of us managed to get ourselves above Gaza and Laurel's place, and the trick turned out to be getting down. The lift over their house was off the charts. I think it must have been all the good vibes blasting up to heaven. The three of us had to fight those vibes to get down! Thom made it first, and I followed him down, and then JK joined us. It was a crazy place to land, but what a fun way to start a party! As we were shuttling our cars back to the wedding, Scrappy landed there as well on his second flight of the day. Let's say you're at Kahana and you're hungry for some of the island's best Poke or Thai food. You could drive to Kahuku. Or, you could fly there! That was my plan for Monday's easterly conditions at Kahana. The clouds were not high but I was hopeful that I could make it work. Sure enough, I managed to get almost up to 2,500 between the clouds over Punaluu to start my long glide. In the past I thought I needed 3,400 or 4,000 to make the golf course. But somehow I had high hopes for this day. Sure enough, I milked a nice offshore line all the way to the end of the golf course. And I sure enjoyed that Poke. But my karma is slightly diminished because I forgot to get any Poke for my faithful retrieve driver, Woody! Thanks for the ride, Woodrow! I will get you back next time. What a sweet 100 mile week. I look forward to more weeks like that. Hopefully I have lots of pilots around to spur me on! Great re-cap again, I was getting tired of watching CMAlps, CM=X for the math wizzes. You sure have a way of making someone go first. That LZ at Gary & Laurels is sweet once you find a way to get down. Looking forward to the videos and to Saturdays re-cap landing on 'An Old Air Strip'. Thanks JJ is having a coffee and a smile.